Hop to these places offering lavish spreads, egg hunts and other fun Easter activities for the whole family. Easter may be a Christian commemoration of new life and the resurrection of Jesus from the tomb, but the long weekend starting with Good Friday on 19 April this year is also celebrated by people from all walks of life with a meal with family and friends. 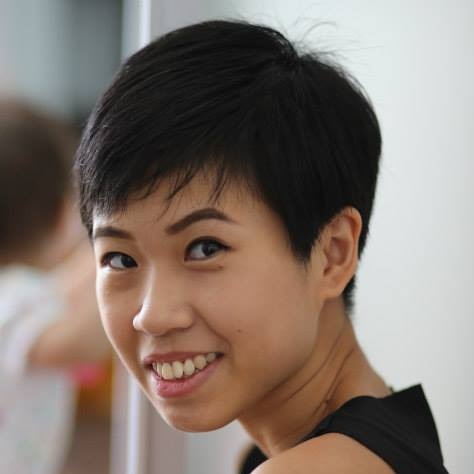 It’s a weekend where restaurants and hotels around Singapore pull out all the stops to roll out Easter-themed brunches with special activities like egg hunts, movie screenings and other festivities. Here are 10 ideas for dining on the Easter weekend this year. 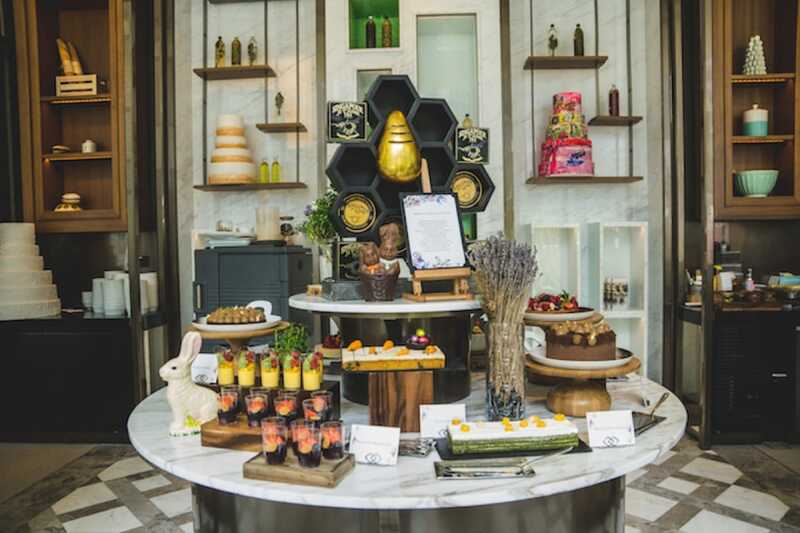 The Capitol Kempinski Hotel Singapore is celebrating its very first Easter with a sumptuous spread at 15 Stamford. The Easter Sunday brunch will feature eight live stations with an array of charcuterie, chilled seafood and freshly cooked breakfast items, but the focal point of the spread will be the wood and charcoal-fired grill turning out the likes of roasted whole lamb, grilled Tomahawk steak and Cantonese roasted Irish Silver Hill duck. Live music and a day-long roster of games and activities for young and old complete the festive experience. Have a modern Cantonese take on Easter celebrations with Mitzo’s Easter Weekend Enhanced Brunch, which will offer over 50 types of dim sum dishes, soups, roast, wok dishes and desserts; including an Easter exclusive dish of crispy deep-fried beef cutlet with a drizzle of creamy sesame mayonnaise. 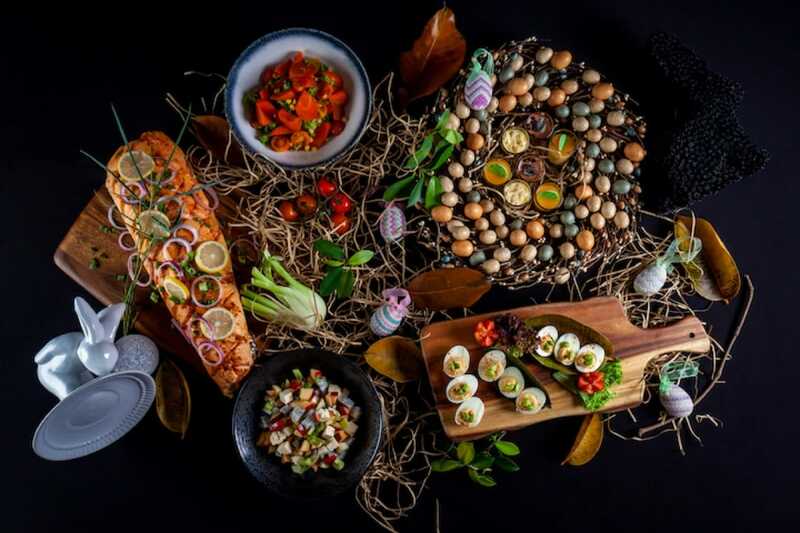 The Easter Sunday brunch buffet at Alley on 25 in Andaz Singapore will be an extravagant affair with the likes of traditional herb-crusted lamb rack, prime rib eye, roasted Cone Bay barramundi, Singapore chilli crab, grilled peri peri chicken and sweet and sour Kurobuta pork. Tuck into fresh seafood-on-ice such as oysters, smoked salmon, Maine lobsters and New Zealand red snapper tartare. 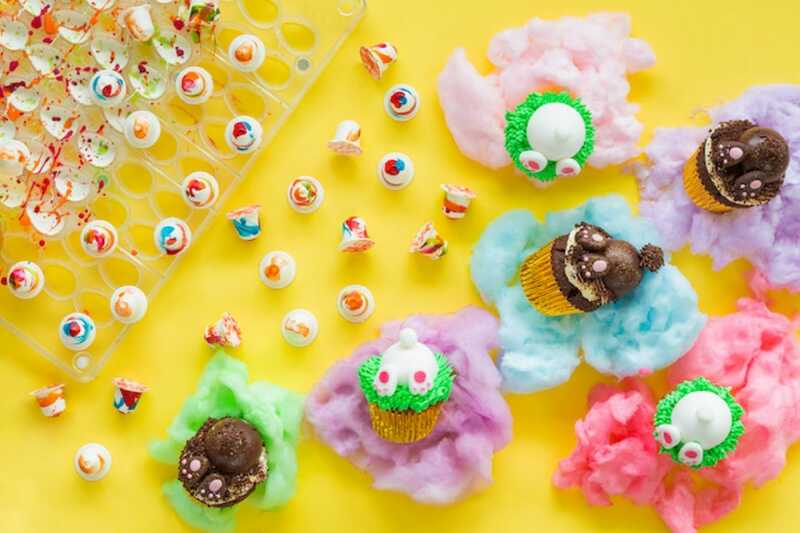 The little ones will be kept entertained with an Easter egg hunt, a colouring station, balloon sculptures and the piece de resistance — a giant chocolate egg smash. East meets West at Racines where the French kitchen showcases classic dishes like sautéed Atlantic Saint Jacques scallops, French duck pan-seared with figs and slow-cooked blackened spiced Wagyu beef brisket while the Chinese brigade puts forth the likes of duck leg confit tossed with chicken floss, deep-fried Barramundi in black bean sauce and Shanghai noodles with shredded chicken in specialty broth. All these are accompanied by buffet staples of fresh seafood on ice, charcuterie and cheeses, as well as fun Easter activities for the kids. 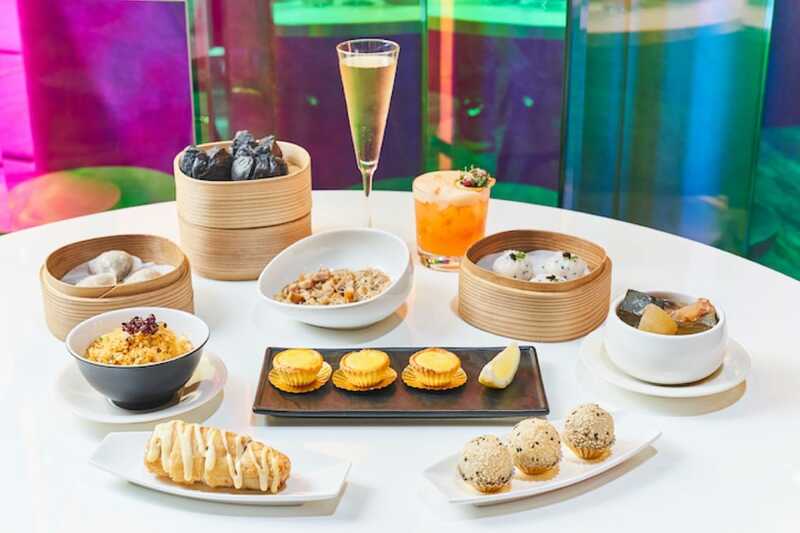 Elevate your Easter celebrations at SKAI in Fairmont Singapore and have a la carte buffet set against the mesmerising view of Singapore’s skyline. For one price, enjoy unlimited hot and cold plated dishes created by chef Paul Hallet such as the succulent Wagyu Beef Tataki and Black Cod Fish, paired with champagne and craft cocktails like Bloody Skai or Singapore Sling Slushie. The Hilton Easter Sunday Champagne Brunch features all the trimmings that make it a perennial favourite over the years — live station with gourmet specialties, a generous seafood bar and carvery — but the highlight must be the six-metre-long dessert table showcasing D9 Cakery’s limited edition Easter-inspired collection full of Instagrammable sweet treats. For Easter Sunday Champagne Brunch, Ash & Elm’s three culinary theatres will dole out festive favourites like Chips Crusted Beef Ribeye, Eggs Benedict with Smoked Salmon and Hollandaise, and a live egg station serving Eggs Royale and Truffle Egg Espuma. In addition, the restaurant’s signature tasting platters comprising nine French-inspired à la minute petit plates will be offered alongside seafood on ice, caviar and succulent roasts. Kids will be entertained at the Bouncy Castle at Carlton City Hotel Singapore while adults indulge in a full buffet spread: there’ll be Herb-crusted Lamb Leg, Honey-glazed Gammon Ham, Roasted Prime Ribs and Baked Whole Soya-Sesame Salmon at the carving station as well as fresh seafood on ice and a spread of appetisers and sweet treats. At Porta, pick a main course from the all-new brunch menu and tuck into that alongside unlimited servings of sides, appetisers, salads and desserts. A live carving station offers whole roasted salmon with lemon dill sauce and béarnaise while the dessert table features a chocolate fountain with condiments. House wines are at 50% off from the second glass. Cheers to that. Have an authentic Italian Easter at Basilico where springtime favourites like Oven-Baked New Zealand Lamb Carre crusted with Bronte Pistachios and Chanterelle Mushrooms, and Roasted Sardinian Porchetta with Purple Potatoes and Romanesco Broccoli take centrestage. Indulge in over 50 varieties of regional Italian cheeses and fresh pastas like handmade Tortellacci stuffed with Eight-Hour Braised Duck, Castelmagno Cheese, Porcini Mushrooms and Black Truffle Sauce. Kids will be thoroughly entertained at a supervised Kiddies Playland complete with a bouncy castle and other fun activities. This Easter, have fun with the children and colour your Easter eggs with a pretty and natural twist.